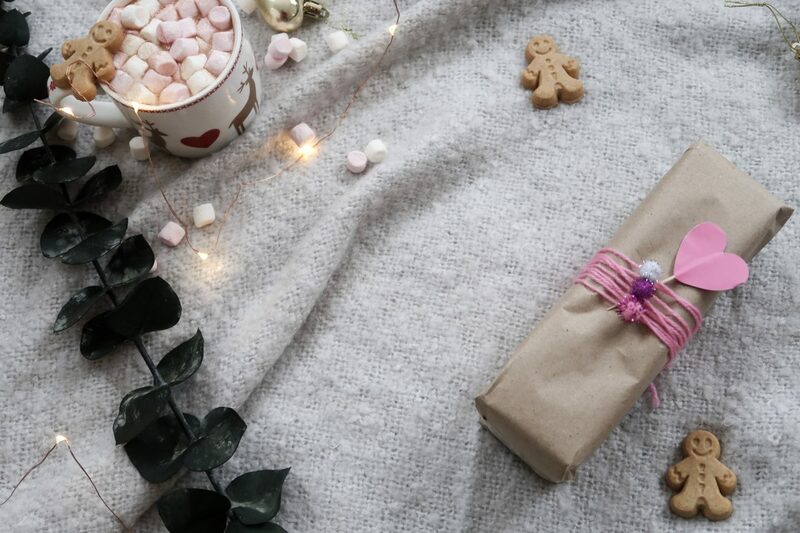 My original Christmas gift wrapping ideas with brown paper blew up so much recently that I decided I’d revisit it 3 years later with fresher ideas and more than I ever did before. 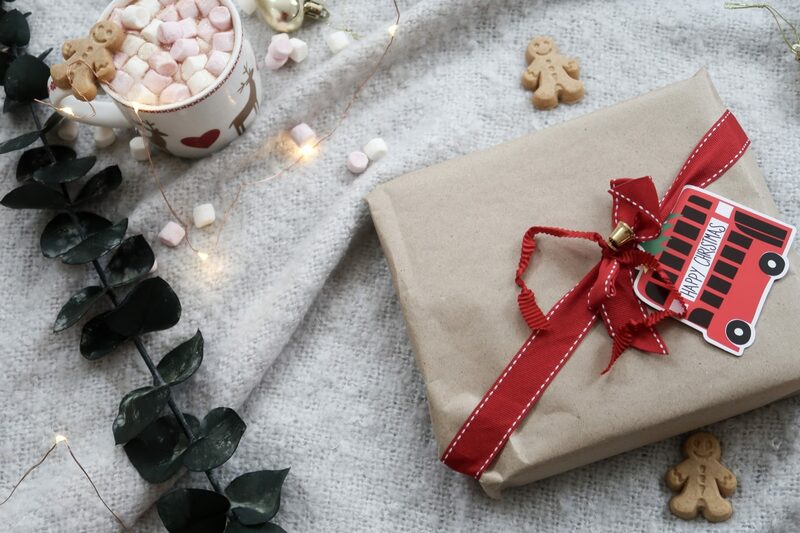 It turns out you guys really like the idea of wrapping with brown paper! 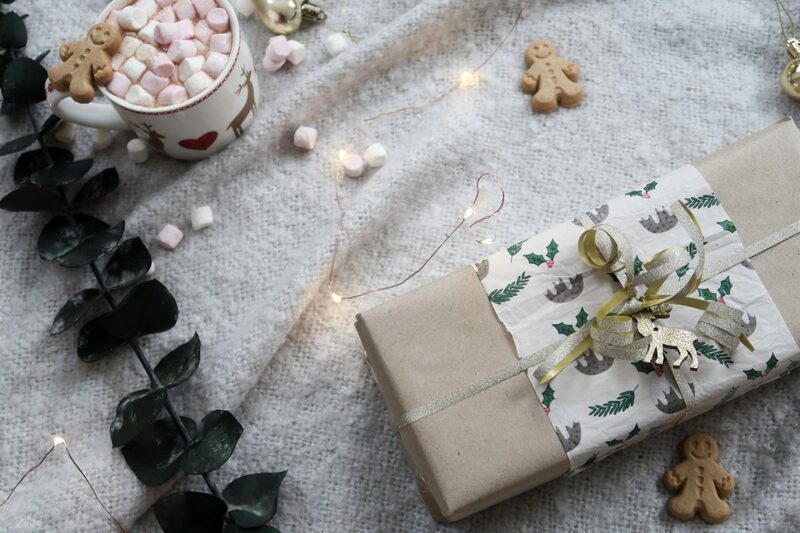 My image that circulated around social media a few weeks ago and which went viral was paired with a bit of text stating how normal wrapping paper is not recyclable, just to clear things up I did not write that. 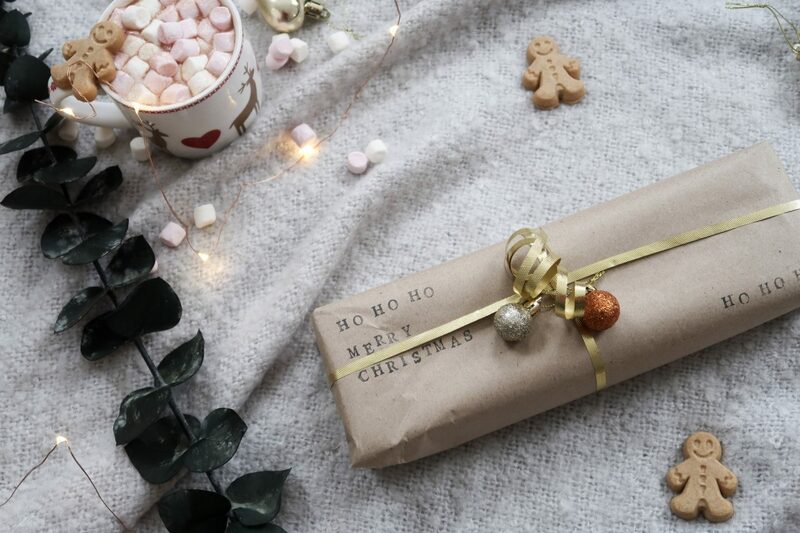 I’m not actually sure who initially wrote that, however, most wrapping paper is recyclable but it is the shiny, foily and glittery wrapping paper that is not. Do the scrunch test to see if it is recyclable, if it springs back the likelihood is that it’s probably made from metalised film which is not recyclable. 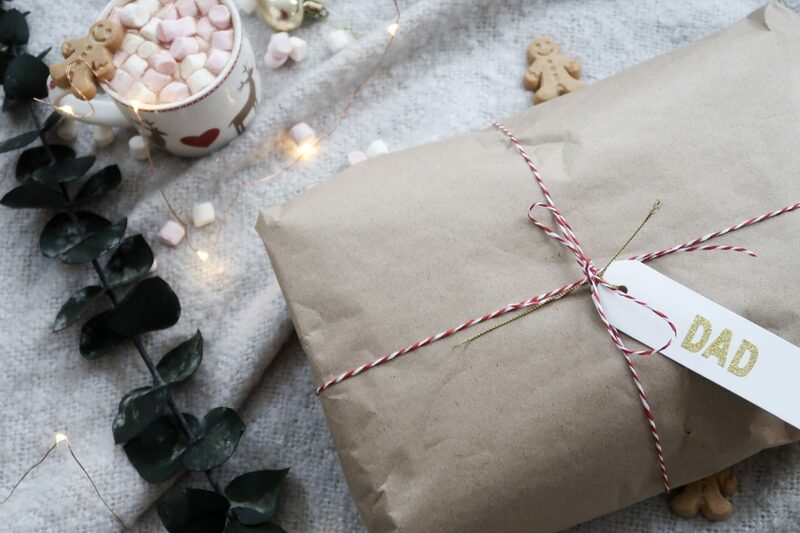 To clear up any doubt, yes, brown wrapping paper is fully recyclable and it actually does work out much cheaper than standard wrapping paper, so it’s a win, win all round. 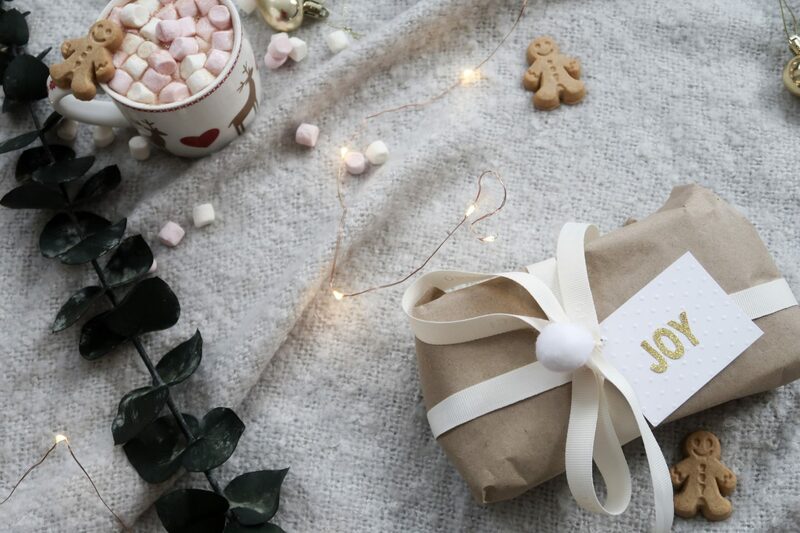 The proof is in the pudding below, but you can see that brown wrapping paper certainly is not boring, and getting a little bit crafty and putting your own unique stamp on each present is actually a lot of fun when joint with Christmas films and hot chocolates, am I right? 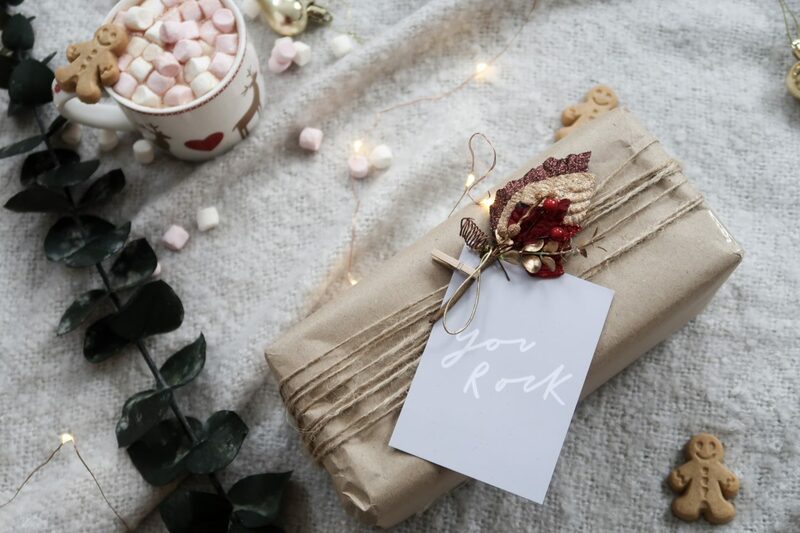 For the inspiring friend or loved one that has always been there for you, why not add an additional element to the present with a little postcard. I always get mine from Paperchase because they’re under 99p and they have a massive selection. I pegged it onto the twine which I wrapped around the present and added on a little festive piece that I pulled off a present last year. 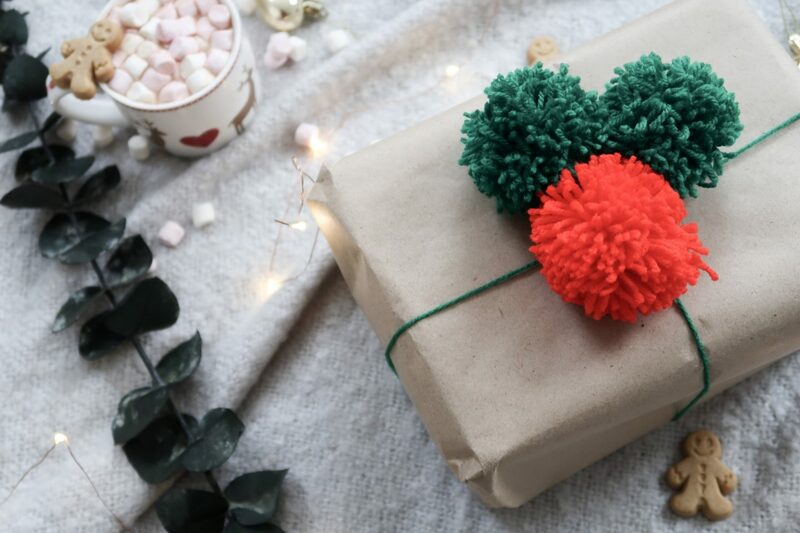 For the little pudding in your life, they’ll love this Christmas Pudding pom pom – so cute! I spied this idea on Pinterest and it’s made in the same way as a pom pom is but one half is made with white and the other half in brown. When I tied it together at the end I cut a large length of wool so that I could wrap it around the present like the above. I added a little red pre made pom pom and stuck some ivy leaves on that I got in a topper set for Christmas last year but it would be easier to cut some green felt for this which would give just as good effect. Simple, but sophisticated. 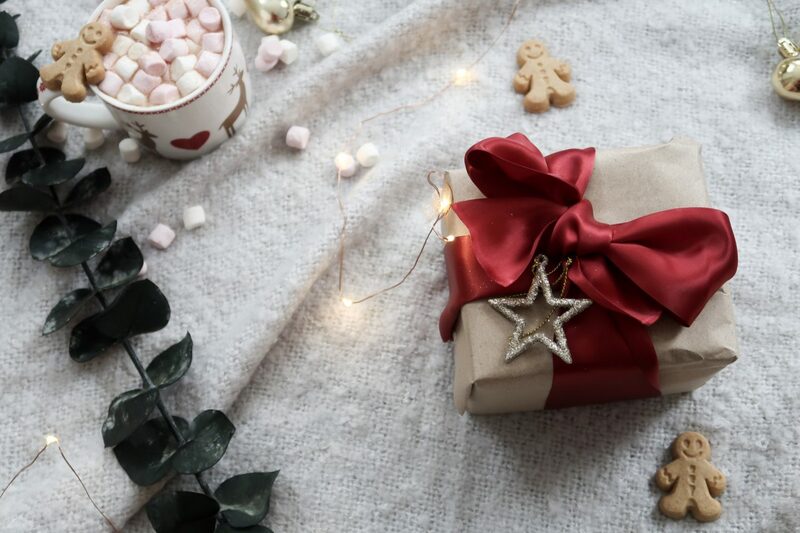 You can’t beat wrapping a gorgeous red ribbon around and adding a little star topper, the recipient can reuse it or use it as a tree decoration after. So easy. Ok, so washi tape really can be used for everything and I found a couple of festive tapes that I bought from Hobby Craft a couple of years ago and I really like the effect. You could finish it off by putting some twine around it and adding a gift tag. I chose to put the tape on diagonally, but you could do whatever pattern you liked. I bought my stamp kit from eBay back in 2015 and I’m still using the same kit and ink now! 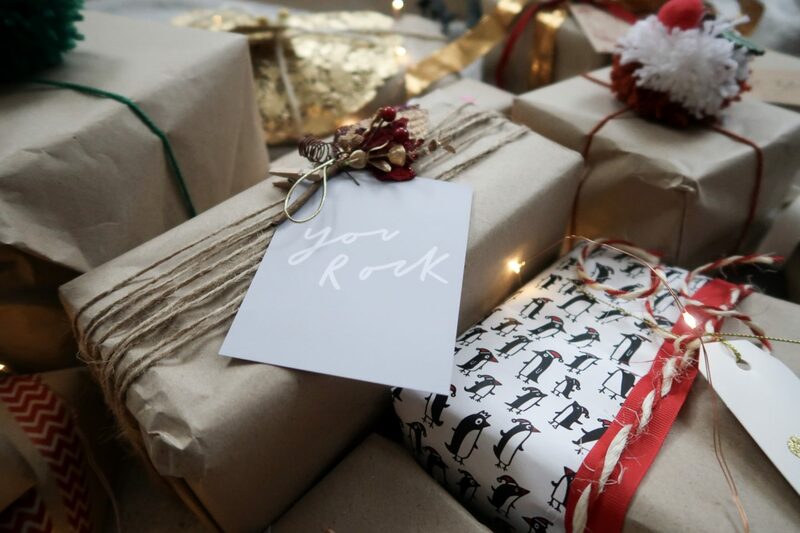 It was such a good purchase and it creates such beautiful gift tags, and prints perfectly onto brown paper. When stamping make sure you wipe the sides of it clean with a paper towel because it will stamp the outline if you don’t, in doing so it gives it a much cleaner and professional finish. I added some bakers twine on too which I LOVE, I have been using it for years and it’s such a timeless look, I topped it with a little gold bauble to finish. I found these scrabble letters from a craft magazine I must have bought at least 5 years ago, better late than never, huh? This is obviously gonna be the gift to give to the scrabble addict which is 100% my dad. I picked up a little topper kit in Tiger recently and got some gold glitter ABC stickers in the pack and I have loved using the letters to create gift tags with them. Spell out initials, names or little Christmas words such as Joy. I did an all white theme for this which I just love, it looks so wintry! 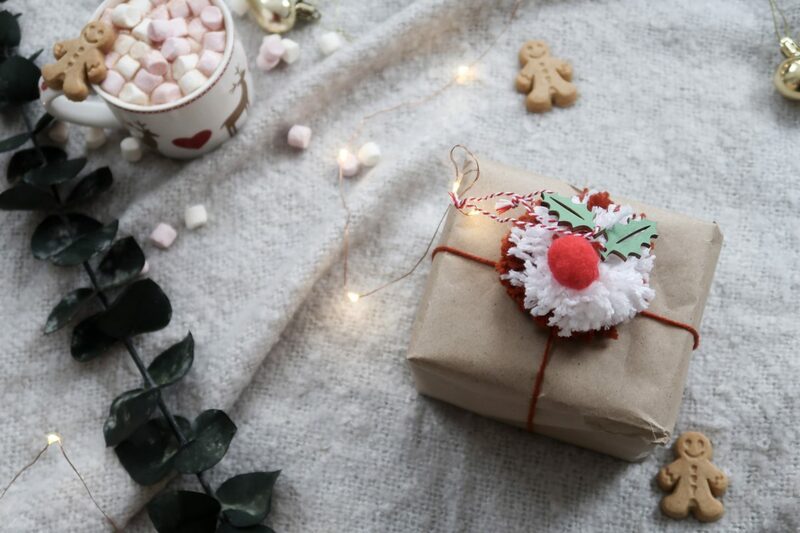 Add a strip of Christmas themed tissue paper or card to the middle of your present and fasten with some curling ribbon and a cute topper. When it comes to receiving presents at Christmas I never chuck away cute bits of tissue paper or baubles as I just love it all, I find that it always come in use again at some point. Pom poms are my fave crafty thing to make and they literally take minutes to do. I use a pom pom machine to make mine but if you don’t have access to one you just need to cut out 2 doughnut shapes onto card which you can wrap the wool around on. I went with the classic Christmas colours to makes these and then attached them all together with the same wool. 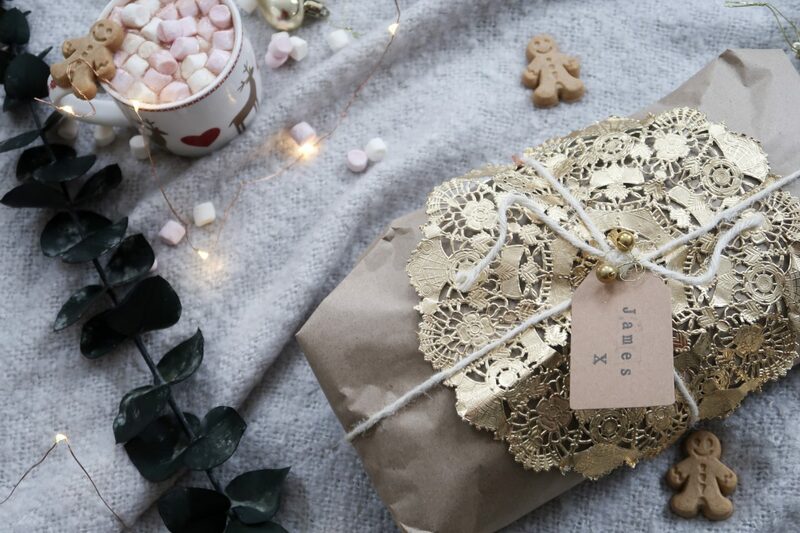 As I mentioned before, bakers twine is one of my favourite Christmas wrapping essentials and it’s so festive, you can attach any gift tag you want, these were plain white tags and I have some gold glitter stickers which I attached to form the name. 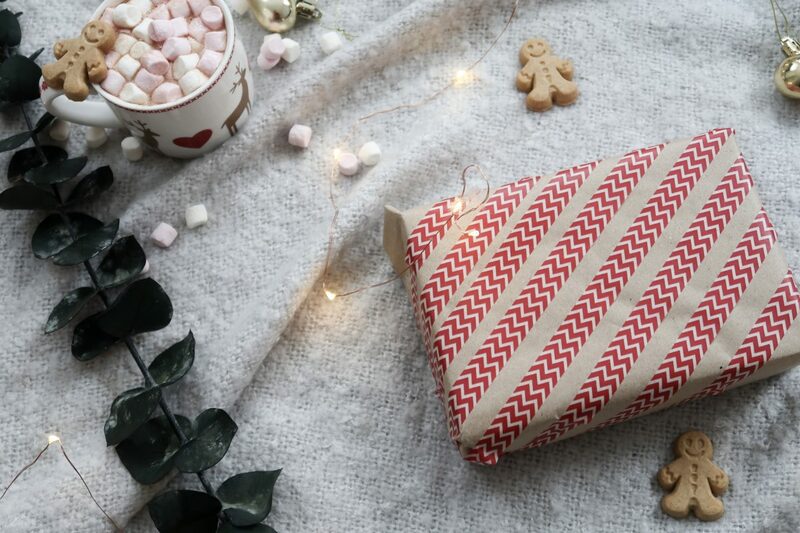 Gift wrapping is the perfect time for using up your little bits, there’s nothing more annoying than having loads of offcuts of your favourite wrapping paper that doesn’t fit around any presents, huh? 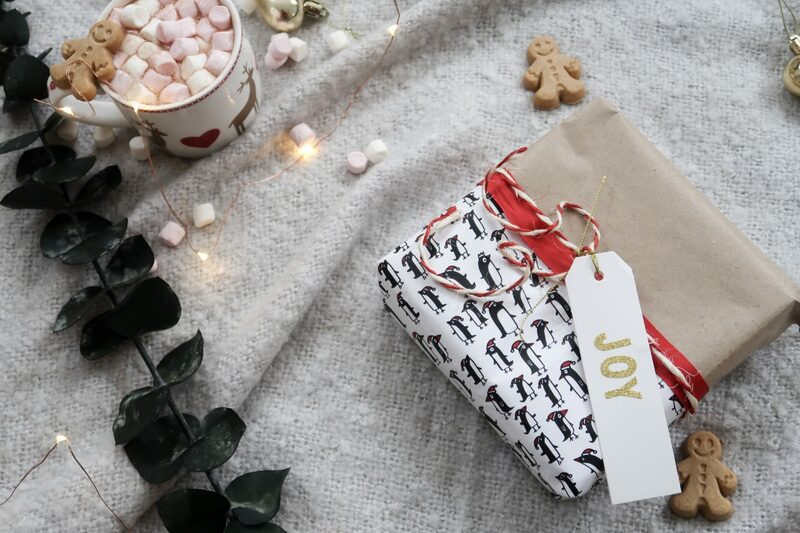 I used this cute penguin wrapping on half of the present and split it down with a ribbon to create this look. I added on another of the tags I made with the lettering Joy to finish it off. 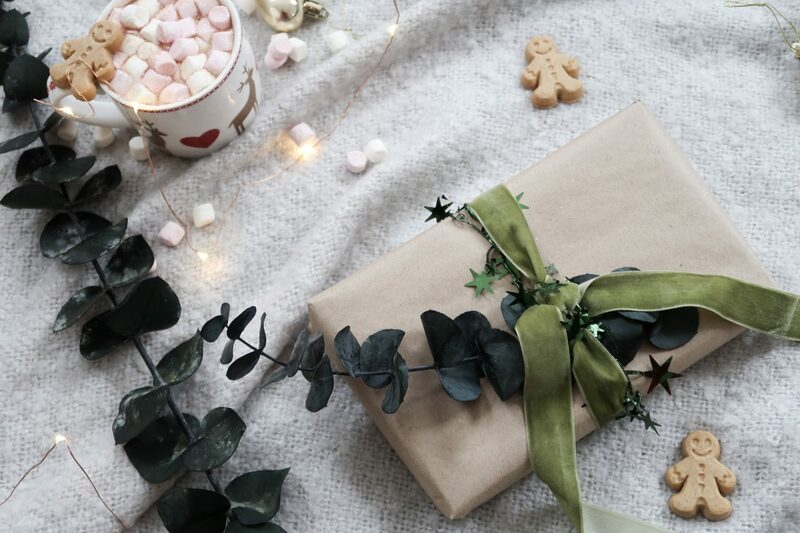 I love adding foliage to Christmas presents, if I’d already got my Christmas tree I would have been cutting bits off the back to add to my wrapping (I did this A LOT last year). It looks great teamed with plain twine for a natural look. Depending on what greenery or foliage is available to you, here are a few ideas; eucalyptus (I used dried), Christmas tree snippets, fir tree cuttings, ivy, holly and berries. Just because it’s Christmas it does NOT mean that pink is off the cards, nuh, uh. It’s the perfect alternative for the young or old girl in your life, lol, I’m 26 and still think dressing in pink like a fairy is the best thing on earth. This was simple to do, I just used some pink wool, added in a little heart cocktail stick and stuck on some glittery pom poms. So cute! Some times you just can’t beat the classic festive colours, but you could colour coordinate with any colour. I picked out some green velvet ribbon, sparkly twine and added some more eucalyptus in for this one. Doilies are for life, not just for tea at your grandparents. 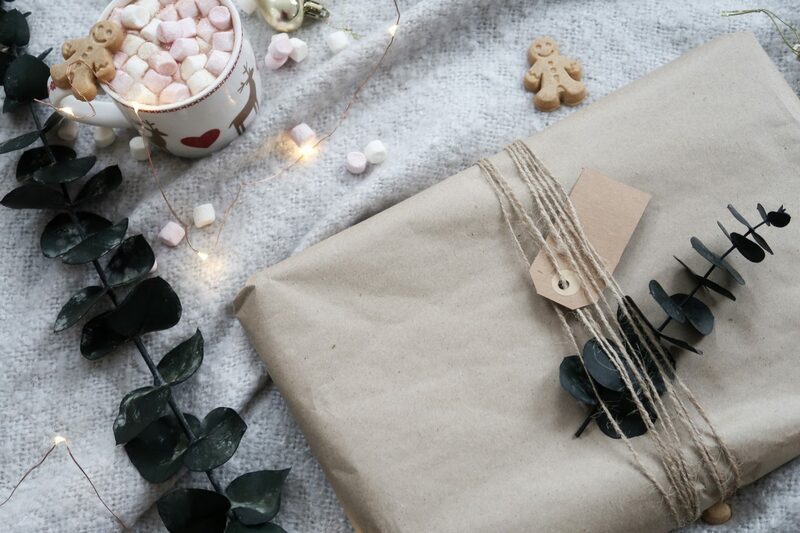 They’re slightly old fashioned, but they instantly lift the brown paper and I tied it up with some natural twine and a hand stamped tag using my stamping kit that I mentioned earlier. Ok. So I had planned on showing you how to create a stamp by using a potato, which is actually really easy btw. 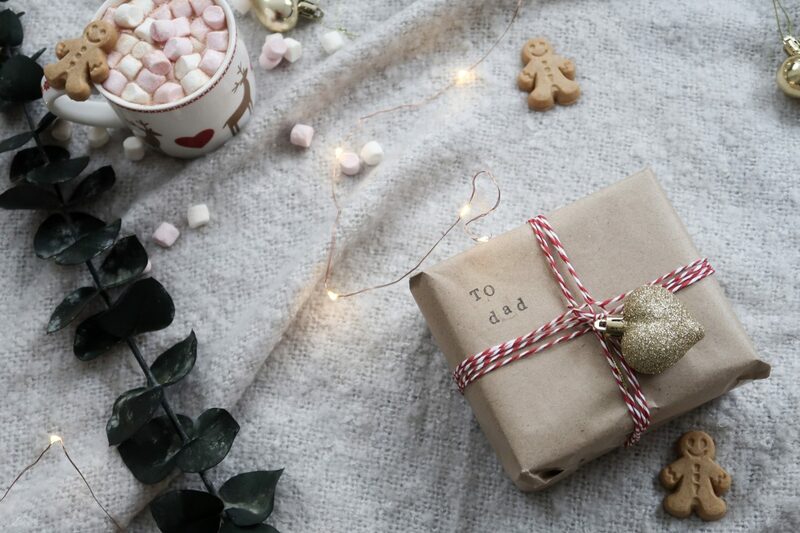 It’s a perfect craft for children to get involved in too, you just need a potato, sharp knife to cut it open and a festive stamp to put into the potato, when you pull the stamp back out you’ll have your chosen shape ready to put into paint or ink and to stamp all over your wrapping. On this occasion I just used my stamping kit again to print festive words all over. Original, or what? I knew eating all those Lindt reindeers would pay off because I saved all those little bells and they play the perfect part in gift wrapping. 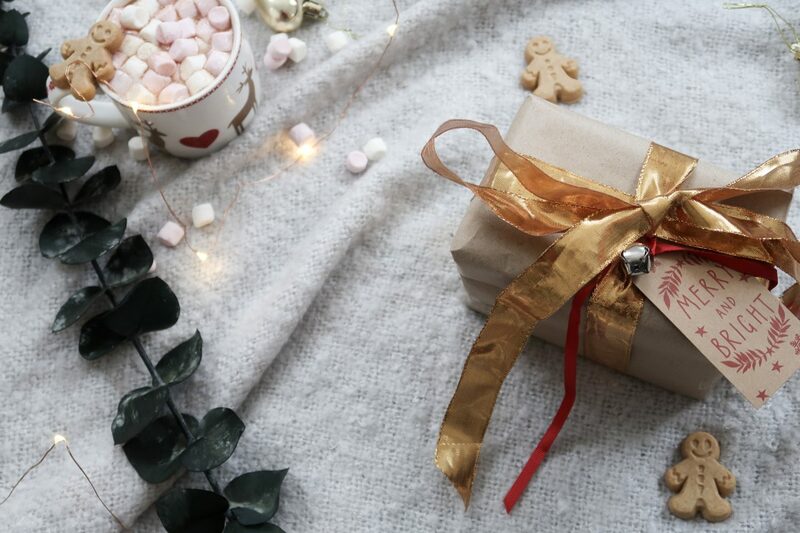 Attach it to your ribbon or tag of choice and it adds a lovely little festive element to the wrapping. 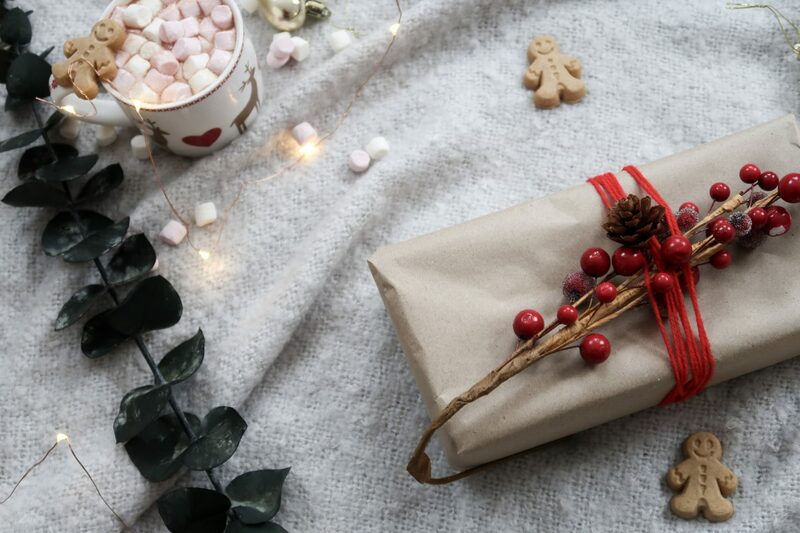 If you’re buying for a lot of people you would not believe how quickly you get through a set of gift tags, I personally try to reuse last years Christmas cards from a sustainable point of view, but also because it’s £££ saved. I only keep the nicest cards, cut them out and punch a hole in, you then just need some ribbons to use to attach them. 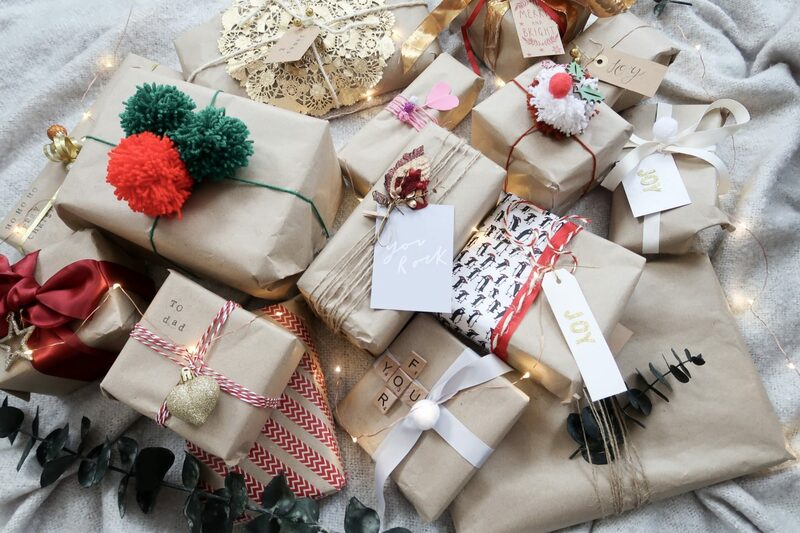 Christmas already creates so much waste so being able to reuse stuff in this way is a no brainer. I attended a calligraphy workshop earlier this year and OK, yes I’m no expert, but whilst doing the workshop I imagined how amazing my Christmas gift tags and cards would look this year, so I’m still learning, but calligraphy adds such a personal element to tags and it’s fun! Last but not least is this little red number <3 I had some fake berries lying around that I didn’t use anymore and added some real pine cones in too. It’s simple, festive and it’s perfect if you have little bits like this lying around that need using up. That’s a wrap! 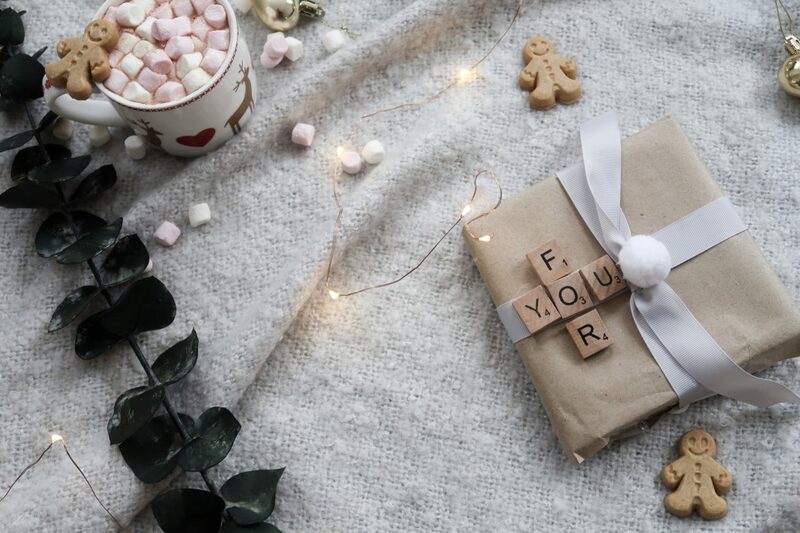 I hope that the above has given you some wrapping inspiration for your presents this year, it’s proof that wrapping doesn’t have to cost a lot, you just need to be resourceful and use what you have available, I for one hoard everything. 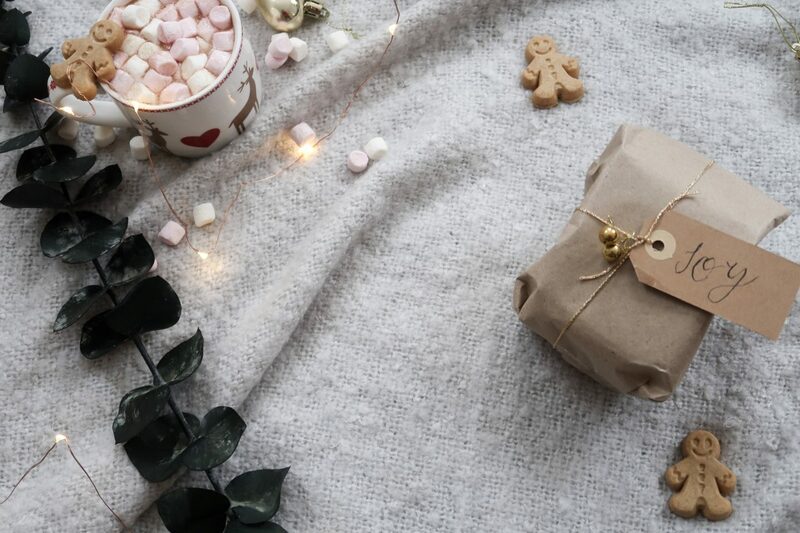 See them in action below..
We produce so much waste as it is at Christmas and every little helps, so will you be making the switch to brown paper with me this year?